A joint USOC-USATF study (High Performance Plan) of the shot put has yielded this detailed and informative report on those factors most important for success. Flight phase: The duration of time where the athlete is moving towards the front of the throwing circle and has no contact with the throwing surface. In the glide technique, this is the period of time beginning when the rear foot breaks contact with the throwing surface until it makes contact again with the throwing surface. In the spin technique, this is the period of time beginning when the front foot leaves the throwing surface until the rear foot makes contact with the throwing surface. Power position: The position that is achieved when the front foot touches down and the athlete has both feet in contact with the throwing surface in preparation for the delivery of the throw. Rear foot: The foot that is towards the rear of the throwing circle when the athlete is in the power position. Front foot: The foot that is closest to the toe board when the athlete is in the power position. Rear-foot touchdown: The point at which the thrower's rear foot makes contact with the throwing circle following the flight phase. Front-foot touchdown: The point at which the thrower's front foot makes contact with the throwing circle following the flight phase. Transition phase: Following the flight phase, this is the period of time between rear and front foot contact with the throwing circle. Shoulder-hip separation: The orientation of the hips relative to the orientation of the shoulders. A neutral position, or zero degrees of separation, occurs when the shoulders and hips are aligned with one another as would be the case in anatomical position. A positive angle occurs when the throwing side shoulder is posterior to the throwing side hip. Release: The first instant of non-contact between the shot and the thrower's hand. Release velocity: The magnitude of the shot velocity at the moment of release. Release angle: The angle at which the shot is released relative to horizontal. Release height: The height of the center of the shot above the surface of the ring at the moment of release. Horizontal release distance: The horizontal distance between the center of the shot and the innermost edge of the toe board at the moment of release. Projected distance: The horizontal displacement of the shot beginning at the point of horizontal release distance and ending at the landing point of the shot. Measured distance: The horizontal displacement of the shot measured from the innermost edge of the toe- board and ending at the landing point of the shot. This is the distance recorded as the official result. More specifically, the measured distance is the sum of the projected distance and the horizontal release distance. Much research has been performed on the shot put. Typically these studies examined release velocity, release angle and release height. Unfortunately, these three parameters paint an unclear picture. They indicate what needs to happen but not what it takes to make it happen. Likewise, many coaching articles have been written which provide the author's concept of ideal technique. All of the information provided in these articles may not always be valid and correct. Some of the suggestions may be based on ideas passed down to the author, successes of former champions (who may have succeeded in spite of their technique), in addition to the personal ideas and biases of the coach. While often very useful, these methods of determination create the possibility for faulty conclusions. The primary purpose of this paper is to mesh together the scientific research with the suggestions and recommendations of coaches to present the critical factors for achieving elite level success in the shot put. The findings presented in this paper are part of the ongoing research of the USOC & USATF's collaborative High Performance Plan (HPP) for the shot put. This project examines various parameters of the. throw in hopes of uncovering the factors most critical to success. In the most simplistic sense, the critical factors are aspects of technique which best predict elite level performance. This information is passed on to elite athletes and their coaches to assist in their development and help them reach the medal stand in World Championships and Olympic Games. The goal is to provide helpful information to athletes and coaches in hopes of directing their technical development, identifying major flaws, and reinforcing strengths. The information is intended to be specific enough to be useful but general enough to account for the unique technical differences inherent in each athlete due to their unique anthropometric, physiological, and stylistic characteristics. It should be noted however that the critical factors for elite athletes may not be the same for developmental throwers. There are three main areas where data and information were collected to determine the critical factors. The first of these was a meta-analysis of previous biomechanical research on the shot put. A database of over 300 throws was created with information compiled of shot puts from both genders at both elite and non-elite levels. In addition to this, an extensive review of previous coaching literature on the shot put and general throwing technique was examined and put through a "scientific filter" to weed out recommendations and suggestions which had no foundation in the basic physics principles which govern human movement. Further, ongoing dialogue with current coaches and athletes has generated ideas for additional investigation. Finally, and perhaps most importantly, ongoing research on today's top American throwers incorporating the above two sources is used to determine and verify the recommendations and uncover other critical factors that may not have been previously considered. As was previously stated, the goal of this project is to determine the underlying factors that contribute to the measured distance of an elite throw. The measured distance of a shot put throw can be broken down into two components (Figure 1). The first of these is the projected distance. This refers to the total distance through which the shot has displaced after leaving the hand of the thrower. The projected distance of the throw is determined by the release height, the angle of release, and the velocity of the shot at the point of release. These three parameters can be used to calculate the distance a projectile will travel using the projectile motion equation (Figure 2). The second component that contributes to the measured distance is the release position relative to the point of measurement, in this case, the toe-board. Of these two components, projected distance makes up to 97% of the measured distance. Since projected distance is the overwhelming factor that contributes to the measured distance, it should be clear that it is important to have an understanding of the parameters that determine it. The projected distance of an object is determined largely by release height, release angle, and release velocity. In the case of the shot put, wind resistance and aerodynamic factors can be ignored. The equation which governs projectile motion (Figure 2) gives us some clues as to the relative importance of each parameter. 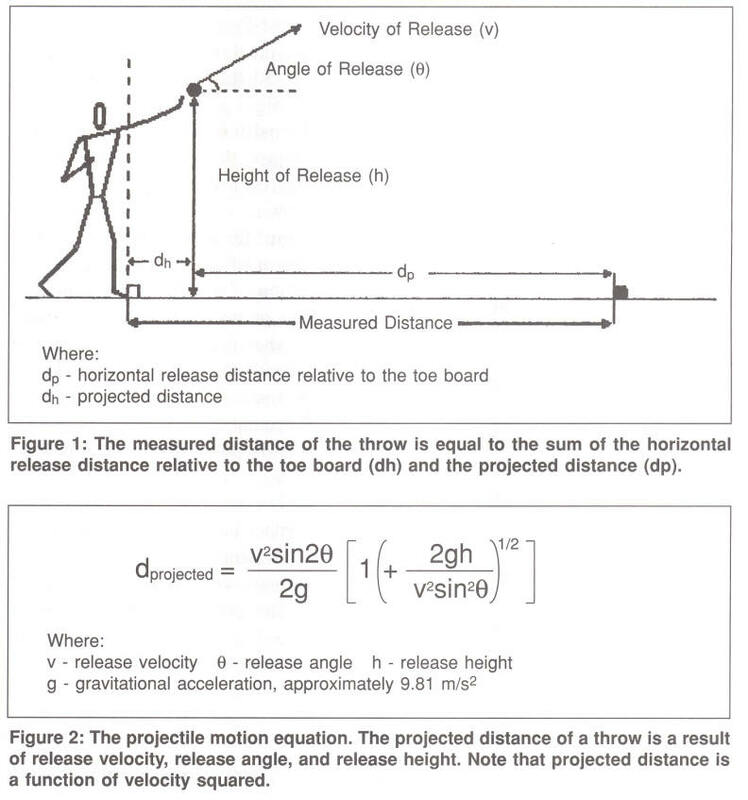 Release height is the least important factor in the projectile motion equation and this is quite convenient, since little can be done to change release height as it is primarily determined by the athlete's anthropometric parameters and to a lesser degree by the release angle. Release angle is the second most important factor in the projectile motion equation and is determined by the angle of the throwing arm as well as the orientation of the trunk relative to the ground. The final parameter in the projectile motion equation is velocity. Projected distance is a function of velocity squared. Consequently, velocity is far and away the most influential of the release parameters. Taking this into account, it would be easy and convenient to consider re- lease velocity as the main critical factor and just have coaches and athletes strive to release as fast as possible. This however would be flawed logic for three reasons. Firstly, other than some specific practice situations, most shot putters typically try to throw as hard and fast as possible already. Telling them to do what they're already trying to do would be unnecessary. Secondly, the correlation between release velocity and measured distance is so strong, it would be redundant to use release velocity as a critical factor. Finally, using velocity as the critical factor paints a confusing picture because while it may be the primary predictor of measured distance, it is actually a result of many other factors that lead up to that point and as a result it should be considered as a product of the prior actions rather than as a means to an end itself. With this in mind, it is important to examine all parts of the throw to determine which factors positively affect the total distance of the throw. The following is a list of the factors that have been determined to be critical to achieving elite level success in the shot put. For simplicity and organizational sake, the critical factors have been grouped into release, kinematic, and temporal categories. While thorough, this list is by no means completely comprehensive and new critical factors may in fact be identified in the future as research continues. Also, the relative importance of each critical factor will vary for each athlete depending on such things as gender, anthropometry, strength parameters, throwing technique used (slide or spin), and individual stylistic elements. As was previously noted, the release parameters are what actually determine the measured distance of the throw. In theory, one could easily use the projectile motion equation to find optimal release parameters that would result in a given distance. These mathematically optimal release parameters could then be used as goals for training. Using this method however would be an effort in futility. The primary reason for this is that in humans, the release parameters are not independent of one another as is assumed by the equation. This dependency phenomenon is due to the fact that unlike man-made projectile machines like cannons and catapults, the human muscle skeletal system is an extremely complex system of levers and pulleys which do not function with equal capacities at all angles or positions. Attempting to achieve mathematically optimal release parameters would most certainly result in shorter measured distances. It is with this in mind that we can establish "real world" critical factors for the release parameters. Because of the significance of release velocity, all other release parameters should only be examined with regard to their effect on this most important parameter. While the dependence of the release parameters is a quite complex phenomenon, a basic understanding will suffice for the purpose of this paper. It is sufficient to know that release velocity and release angle exhibit a strong inverse relationship. That is, for any given thrower, as one of the parameters increases, the other decreases. Keeping this in mind, it should be obvious that one the simplest ways to increase the release velocity, and thus measured distance, is to manipulate the release angle so that it maximizes release velocity while still maintaining an angle that will permit elite-level distances. Release velocity is undoubtedly the most important factor in determining the distance of a throw. Release velocities in excess of 13 m/s are necessary for elite-level throws. As such, all attempts should be made to maximize release velocity. This recommendation however must be made with the caution and advice that increasing either the athlete or the implement velocity at one phase of the throw will not necessarily increase velocity at release. In fact, HPP research has indicated that the opposite may be the case. This is most likely due to the fact that increasing velocity prematurely can result in instability, technical problems, decreased muscle loading, or inefficient sequencing of muscle contractions. The primary importance of release angle is its effect on the release velocity. As long as the release angle is within a range permitting elite-level throws, it should be optimized to enable greater release velocities. In so doing, the measured distance will be greater. HPP research has indicated that for humans the release parameters are optimized when the angle of release is between 31� and 36�. This is considerably lower than the mathematically "optimal" range of 40� to 43� for elite throwers determined by using the projectile motion equation. While it is impractical for coaches and athletes to aim for exact release angles, it is important to know that lower release angles are actually advantageous as long as they still permit elite-level throws-and that the mathematically optimal release angles will more than likely result in decreased throwing distances. HPP research has indicated that the horizontal release position relative to the toe board is a critical factor to throwing success. The optimal horizontal release position should be between 0.2m and 0.5m in front of the toe board, with this distance being largely determined by the anthropometry and technique of the athlete. This distance itself makes up only about 2-3% of the measured distance but this does not reflect the potential benefits of a longer path of implement acceleration. With this in mind, the horizontal release position is significant for both its potential to create an advantageous (or disadvantageous) release point and also because it can be an indication of a greater range of force application to the implement. Kinematic parameters are those which relate to the movements of the body without regard to the forces that cause those movements. When most coaches and athletes refer to "technique" they are primarily speaking of an athlete's kinematics. Six critical factors have been chosen in this category. A long sweeping free leg refers to the non-support leg on a rotational thrower as he is making the turn and subsequent flight phase to enter the center of the circle. A wide sweep of the free leg will help to maximize the rotary momentum of the rotational thrower as he enters the flight phase and will assist in developing greater positive separation (Figure 3) between the shoulders and hips at rear-foot touchdown. The correct execution of the free leg should be characterized by a great toe-to-toe distance (Figure 4), a wide radius about the free-leg hip axis, and a sweep that is low enough to the throwing surface to not disturb balance but high enough to optimize the effective radius of the leg. It has previously been thought that the path of both the athlete's center of mass and the shot should ideally travel in a linear path, with the lowest point being at the beginning of the throw and the highest point being at the moment of release. Recent research however has shown that this may not be the case. In fact, HPP research has indicated that the S-shaped path (Figure 5) of both the thrower's center of mass and the shot as seen in the sagittal plane of most throws is not something to be corrected but is actually advantageous. This undulation creates an opportunity to activate the stretch reflex upon landing and in so doing increases the muscle activation of the legs. The stretch reflex is an involuntary reflex contraction of a muscle in response to the stretching of an attached tendon or the muscle itself. When the rate of length change in a muscle is great, this involuntary reflex creates more forceful and powerful muscular contractions than would be possible under voluntary control alone. The response of the muscles to the reflex is directly related to the rate of the stretch. As such, an increased rate of stretch will result in increased involuntary muscle activation via the stretch reflex. In the shot put, the rate of stretch can be enhanced by maximizing the vertical velocity of the athlete when he lands following the flight phase. This can be achieved by increasing the maximal height of the athlete's center of mass during this period. The higher the apex of the center of mass during the flight phase, the greater the athlete's vertical velocity should be upon landing. Every athlete will have an optimal height which will primarily be determined by his eccentric strength and the capacity of the nervous system to respond to sudden changes in muscle length. The important point though, is that an increased center of mass height achieved during the flight phase is not an error and can in fact be advantageous. HPP research has indicated that greater rear-knee flexion at rear-foot touchdown is one of the best indicators of success in the shot put. The ideal rear-knee angle at rear-foot touchdown should be approximately 100� with this value being highly dependent on the strength of the athlete. Most athletes land in a position with much greater extension of the rear knee joint. Greater flexion of the rear knee at rear-foot touchdown may provide an opportunity for the musculature of the rear leg to function with favorable leverage and operate through the strongest portion of its force curve. This would result in greater implement acceleration. Greater rear-knee flexion may also be indicative of the position of the athlete's center of mass relative to his base of support as well as the position of the shot relative to the hip. Both of these points have been suggested by coaches as important factors for the shot put. It must be noted however that knee flexion beyond the proposed optimal value could potentially have a greater negative effect on the throw than having lesser flexion. The depth of knee flexion which results in decreased performance has yet to be determined. 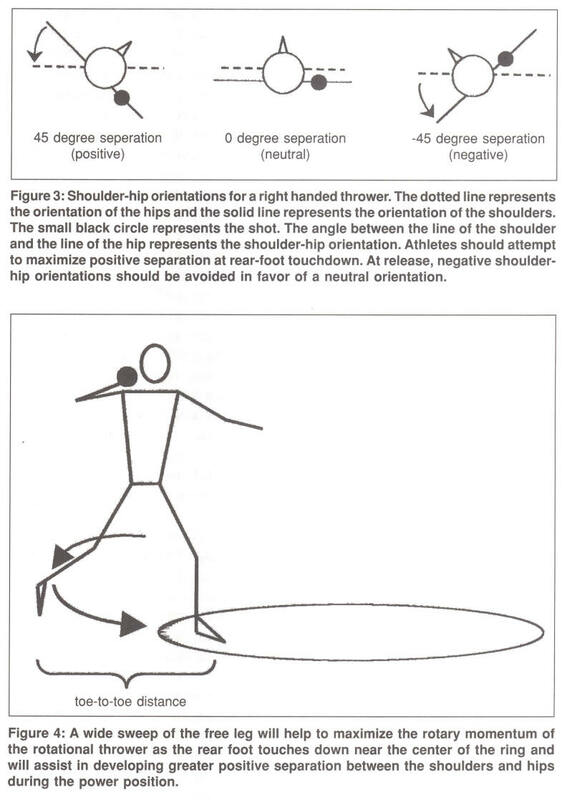 Positive shoulder-hip separation as defined by this paper has long been advocated by throws coaches (Figure 3). HPP research has provided evidence that a greater degree of separation is advantageous to maximize throwing distance. This is most likely due to the fact that greater separation between the shoulders and hips at rear-foot touch- down creates more pre-tension in the abdominal musculature and also creates a longer path around which the shot can travel before being released. This provides the opportunity to increase the time of force application to the implement and in so doing accelerate the shot to a greater extent. HPP research has indicated that greater rear-knee flexion at release is a significant predictor of the measured distance. This is in stark contrast to the recommendation that complete or near complete extension of the rear or both legs is crucial for achieving maximum distance. The reason for this discrepancy may lie in the fact that the rear-knee angle at release may not be a critical factor in and of itself but rather an indication or effect of the extreme power and explosiveness needed to be an elite level shot putter. A similar phenomenon has been seen in sprinting, jumping for height, and Olympic weightlifting. 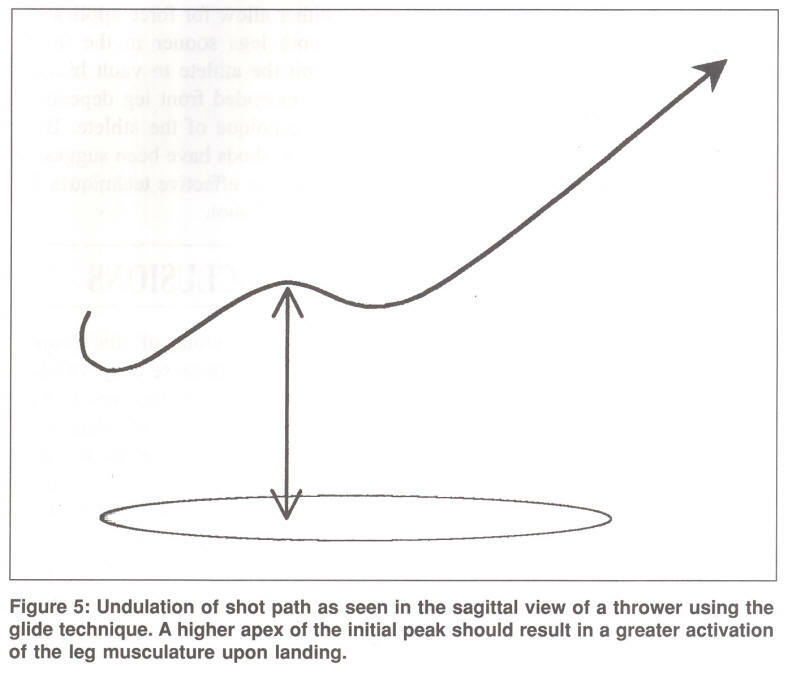 In such a case, the initial force generated by the legs accelerates the athlete and shot system with such rapidity that the shot is either released prior to the point of complete extension of the legs or the athlete breaks contact with the ground making further extension of the legs inconsequential. As such, it may very well be advisable to instruct athletes to strive for complete extension of one or both legs but those athletes who are very explosive may never have the opportunity to even approach full extension. The results of HPP research have indicated that a neutral shoulder-hip orientation at release will help to maximize throwing distance (Figure 3). This is most likely because small or nonexistent shoulder-hip separation is an indication of a strong non-throwing side block. Such a block, would result in a transfer of momentum from the non-throwing side to the throwing side which would in turn increase the velocity of the throwing side and implement. Temporal parameters are often mentioned in coaching literature but there is little evidence to suggest that the many timing patterns previously suggested have any significant effect on the outcome of the throw. In fact, only one temporal parameter appeared to have any effect at all on the distance achieved. The transition time is the period of time following flight phase, between rear- and front-foot touchdown. A short transition time appears to be beneficial for throwers using the glide technique but no such benefit has been seen in rotational throwers. A near simultaneous rear- and front-foot touchdown may either allow for force application from both legs sooner in the throw or permit the athlete to vault himself over an extended front leg depending on the technique of the athlete. Both of these methods have been suggested by coaches as effective techniques for throwing the shot. The conclusions of this project are significant because they validate some of the previous theories on shot putting and reflect those that were not valuable. Given the results, it is important to note that they do not apply equally to all throwers. Likewise, they are most likely not the most critical factors to the success of a novice or sub-elite thrower. These critical factors do however provide valuable information for coaches and elite shot putters and should be used as a guideline for technical development.